Today’s adventure with Baby Hazel is to get her ready for some garden chores and games with a few of her nice friends! 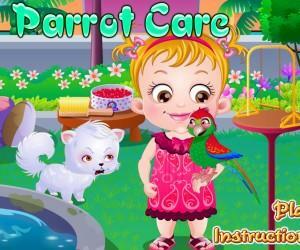 Help our adorable baby remain happy throughout each level of the game and gain hundreds or even thousands of points. Enjoy playing the game with this lovey-dovey little girl as she pick her favorite clothes, put on a little make-up, send text messages to her friends, decorating bird houses and do some back yard dance showdown with her friends. Feeling a little excited yet? Then click on the “Play” button now! Baby Hazel has just woke up and your priority to keep her happy is by helping her get some breakfast, sending out SMS to all her friends and invite them to her garden party, choose her favorite dress to wear and put some make-up on. Now that she’s looking good and fabulous, she can go out and greet her friends! In the second level of the game, help darling Hazel welcome her friends in her back yard garden. This time around they’ll be painting and decorating pots, stones and bird houses and you can help them complete their tasks by using your computer’s mouse and hovering it over some of the items they need. Oh! And they’ll be having their friendly pop quizzes too! And for the last phase of this game – you’ll need to help Baby Hazel and her friends setup the garden, plant some flowers by moving them from their flower pots onto the newly formed flower beds and decorating it with those colored stones that they had painted earlier. You will love helping the girls cook some barbecue roasts, eat the mouth-watering foods they cooked and have a final dance showdown that compliments the entire game! This game is totally entertaining especially for small kids and youngsters, but even if you’re an adult there are a lot of fun and educational things in it also. This game will teach you that it’s good for you to go play outside and enjoy the company of your friends. As opposed to other games where it wants your complete attention, this game lasts for about 15 – 17 minutes total and after you’ve played this game; you would be enticed to go outside and play as well – just like our adorable Hazel did! Baby Hazel is hosting a party in the garden for her friends. She needs your help to set everything up for the party. The preparations start by sending the invitations to her friends, then she will dress up in flower­print clothes and matching accessories, and finally she will enjoy together with her friends the fun-filled activities in the garden. Use the mouse to play with the main character and secondary characters as well as her surroundings.